If you've been at Temple Israel on a Thursday evening, you may have heard strains of Israeli music emanating from Founders Hall and wondered what it's all about. 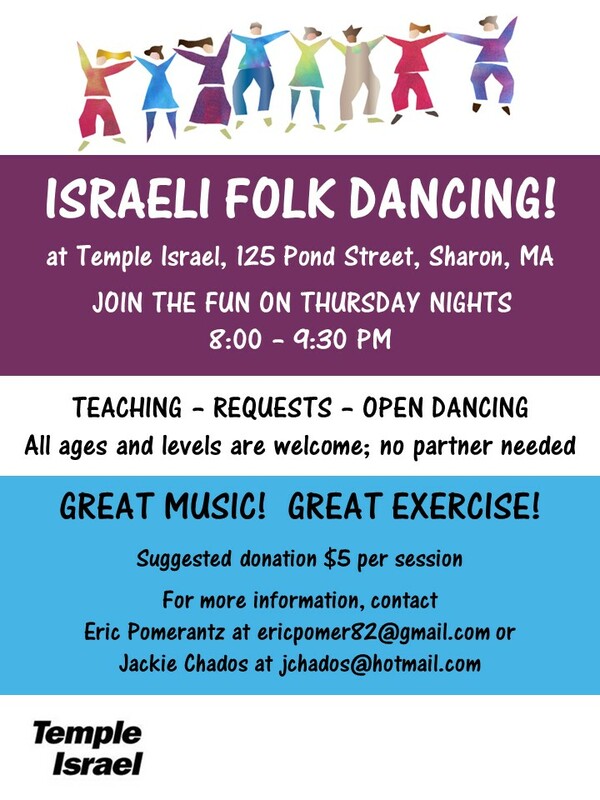 Most Thursday nights throughout the year, we run an Israeli folk dance session from 8:00-9:30pm. All ages and all levels of experience are welcome! Typically, we start with easier dances and have some teaching in the first half of the evening and do intermediate/advanced dancing during the latter half. No partners are required, as the dances are circle and line dances. Wear (or bring) dry, comfortable shoes. Suggested donation is $5 per session. Sessions are led by Eric Pomerantz and Jackie Chados. Contact ericpomer82@gmail.com for information or to be added to our email announcement list. Israeli folk dance began amongst the chalutzim (pioneers) in the early 1900s, prior to the establishment of the State of Israel. By the 1940s, there were folk dance festivals taking place on kibbutzim in Israel, with Israeli choreographers creating their own original dances. Israeli folk dance was influenced by surrounding cultures, as well as the countries of origin of arriving immigrants. Persian, Latin, Indian, and many other dance styles have been incorporated into Israeli folk dance. Just as the Israeli nation has welcomed Jews from all over the world to its shores, so too has Israeli folk dance evolved to include influences from cultures throughout the world. Don't worry if your dance moves are not like Baryshnikov. Folk dancing is about having fun, being part of a community, and feeling connected to Israel. The most important dance move is to have a smile on your face; don't worry about what your feet are doing!